Product prices and availability are accurate as of 2019-04-18 02:31:42 EDT and are subject to change. Any price and availability information displayed on http://www.amazon.com/ at the time of purchase will apply to the purchase of this product. 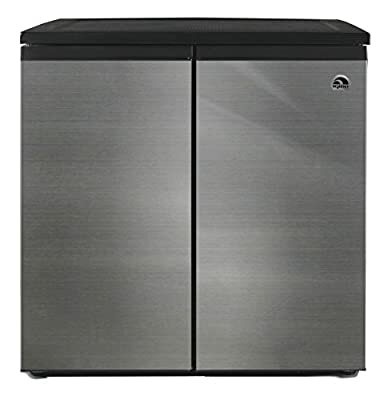 This IGLOO Side By Side refrigerator Freezer combo is perfect for the kitchen, home office, office and dorm room. IGLOO delivers a gorgeous looking 5.5 CU Foot combo that is great for your cold and frozen items. The dual doors open wide for easy access to your favorite beverages or snacks and the stainless steel doors hold up to the toughest environment. Included with this fridge is 3 removable and adjustable shelves and 3 adjustable clear refrigerator bins. This unit also includes a clear crisper drawer so you can keep all your vegetables fresh! There is a full range temperature control and an interior light in the unit. The integrated door handles gives this a sleek and contemporary look. With the hard work top cover you can use the top of this fridge as a workstation without worrying about scratching the fridge. 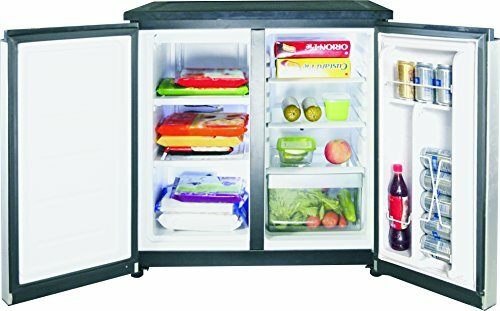 This is a very unique and useful fridge/freezer! IGLOO is the best name in the cooler, refrigeration business and this side by side is no different.